Hitting the road this summer? Maybe you should pack the cat! Social media has given us a little window into how the other cats live. And they are not just sitting at home. 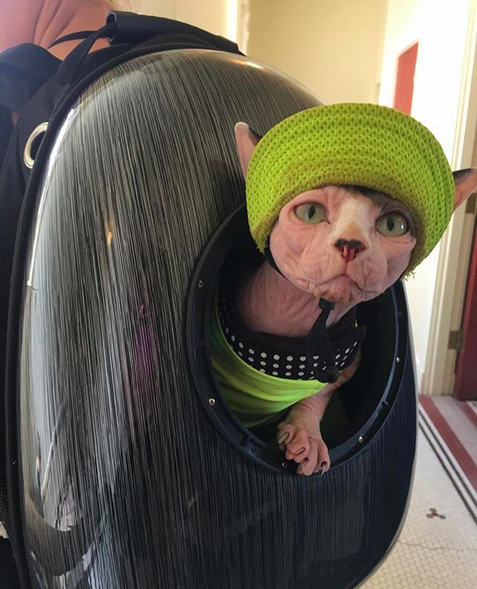 Cat travel is a thing: cats are taking to the highways and hitting the trails. That Cat Life caught up with a couple cool cats who are logging a lot of miles to get specifics on traveling well with cats. 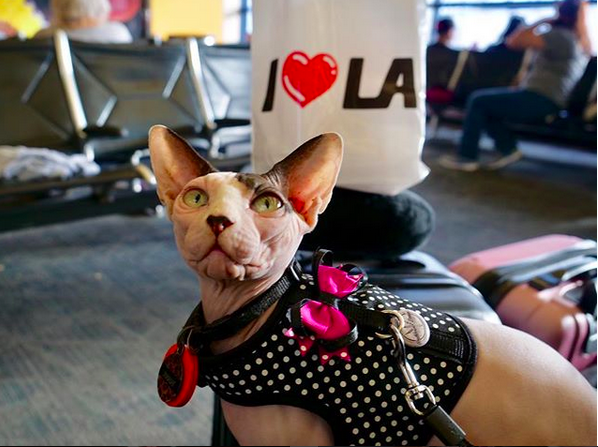 Thanks to her humans’ marketing gig, Zuulie is one well traveled cat. From her home base in Baton Rouge, Louisiana, Zuulie has traveled by car and plane across the country. At just one and half years old, she has already been to more states than many grown folks, always alongside her main gal Margo. Zuulie herself is an aspiring brand ambassador. 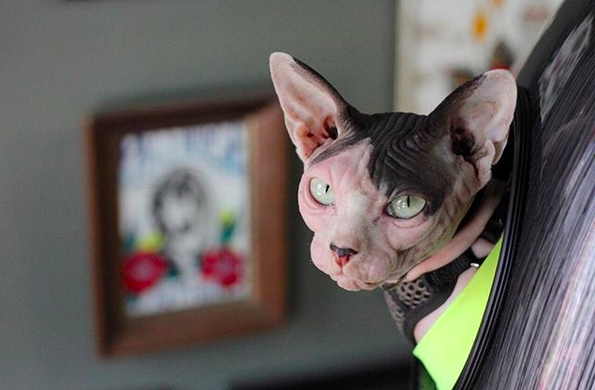 Her sparkling personality and Sphinx beauty have already earned Zuulie one major brand assignment and a lot of swell cat swag. Take notice, Hollywood: this cat has star power. If Zuulie is road warrior, Karlie Klaws is a weekend warrior. 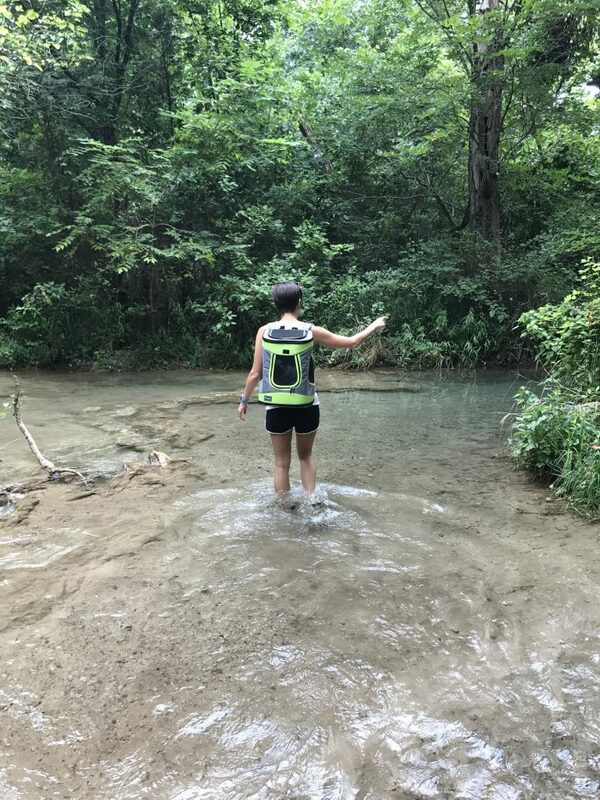 From her home base in St. Louis, Karlie can be found most weekends exploring Missouri state parks, and beyond. Not just a Missouri girl, Karlie has successfully navigated a couple multi-state car trips, including from St. Louis to the Gulf Shore and also Colorado. Not only does Karlie travel expertly by car, she also camps and hikes. 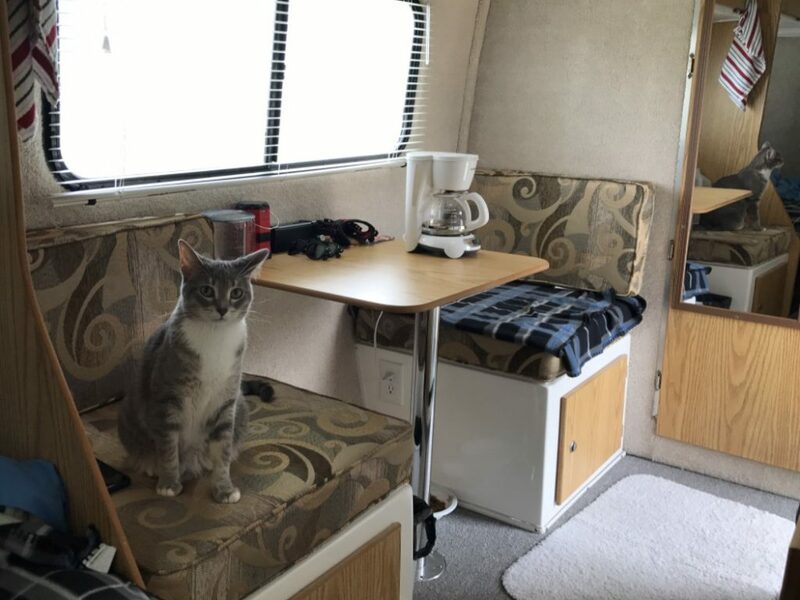 In fact, her human Kristen has designated Karlie an “adventure cat in training.” On their weekend wanderings, Karlie resides in the air conditioned family camper and takes to the trails on either a leash or in mom Kristen’s backpack. For both driving safety and the safety of the cat, experts recommend always transporting cats in a carrier. A carrier keeps your cat secure and safe, reducing the risk of escape or injury. A contained cat is less likely to distract the driver by leaping on the headrest or crawling under the brake pedal. Secure in their container, the cat is usually reasonably content, and certainly secure. Here at That Cat Life, this works for us. There is a new breed of veteran, well-traveled kitties out there who are logging serious road miles. Whether it is training or temperament, these cats travel like champs: the ultimate travel buddy. Always along for the ride, Zuulie does most of her traveling by car. 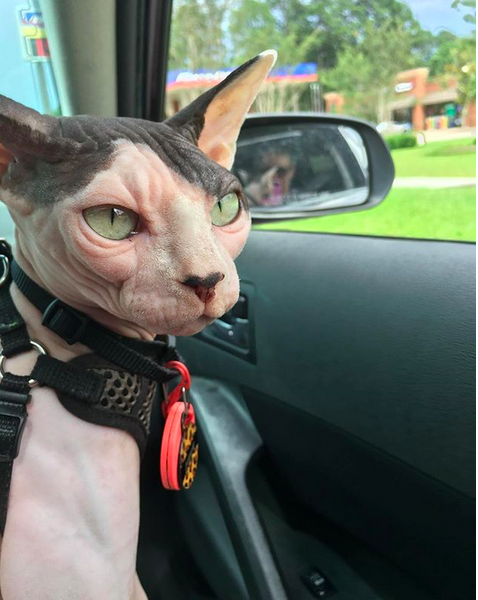 Her mom, Margo, explains that Zuulie is super laid back and likes mostly to ride quietly in the back seat. 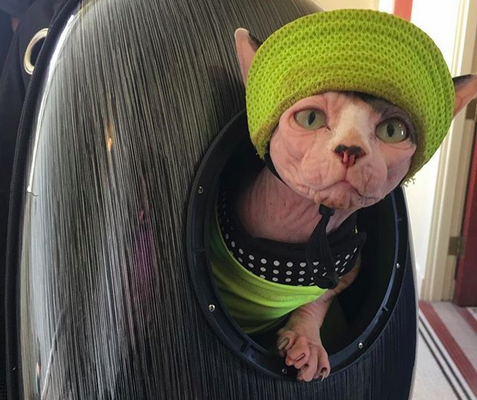 Zuulie mostly rides outside of her pet carrier, though with a harness on. While this is can be the subject of controversy, it works for Zuulie and Margo, who likes to look out the window. Karlie also travels well by car and is only distressed by the winding, curvy backroads of southern Missouri. 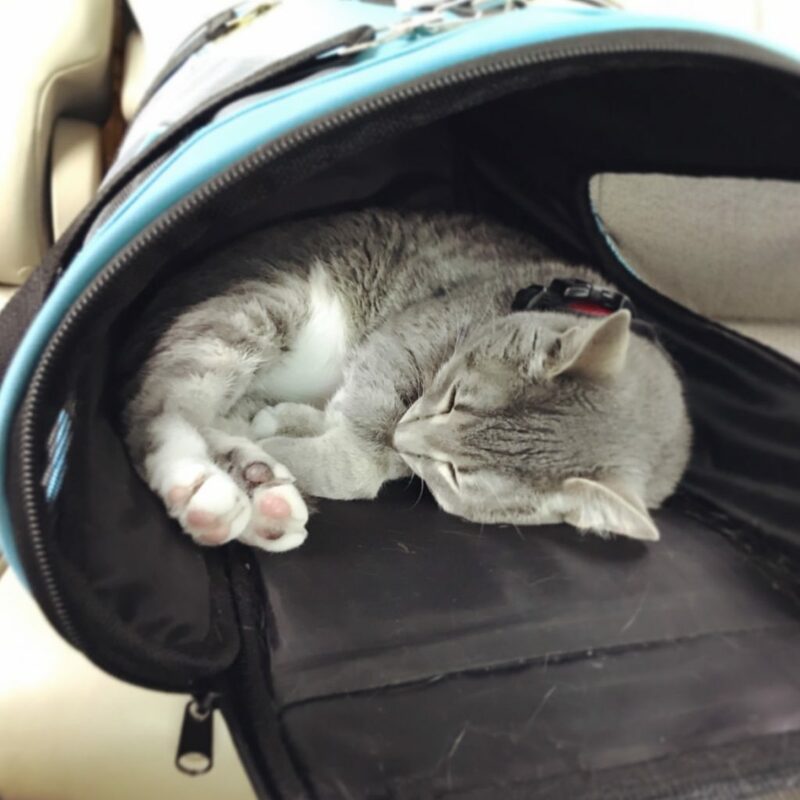 Expert Trick from Karlie Klaws: If your cat has a difficult time traveling by car, try covering the cat carrier with a light cover or blanket for a calming effect. Karlie’s carrier is strapped into the seatbelt. There is a great deal to be said for traveling with your cat early and often. They learn. Personal experience at That Cat Life includes a cat that couldn’t make it past a two hour car ride in the cat carrier without requiring an emergency stop to fumigate the vehicle and execute a hasty cleaning of the carrier and cat. Now in his senior years, this boy has learned that this is a losing experience for all and we are now several years without incident. For some cats, tapering on food availability approximately six hours before a big car ride can help. Keep water available and offer small amounts of food periodically during this time. With road warrior life that Zuulie leads, it’s no wonder her girl Margo has come up with an ingenious solution for handling the bathroom question. For a traveling litter box, Margo uses a small plastic storage bin with a lid. In the car, the box is placed behind the driver’s seat (without the lid on), so Zuulie may access it as needed. When it’s time to transport the box between the car and a hotel room, the lid goes on the box and it is easily moved. What about odorous complications in the vehicle? Yes. Windows are deployed and there has been emergency stops! Being the ultimate travel cat, Zuulie also travels regularly by plane. As a certified therapy cat, Zuulie is able to travel in the plane with Margo. Margo says that while she always has Zuulie’s carrier, Zuulie actually sits in her lap during flights. Not surprisingly, Zuulie enjoys practically celebrity status on flights, with fellow passengers and flight attendants fussing over her. “There has never been a problem,” reports Margo. Where Does the Cat Stay? Getting there is part of the that travel cat life, but where does the cat stay once at the destination? For Zuulie, the answer is simple: she goes where her human goes. She can almost always be found with Margo. Margo says that she tries to select pet-friendly hotels. Specifically, she highly recommends Drury Hotels. 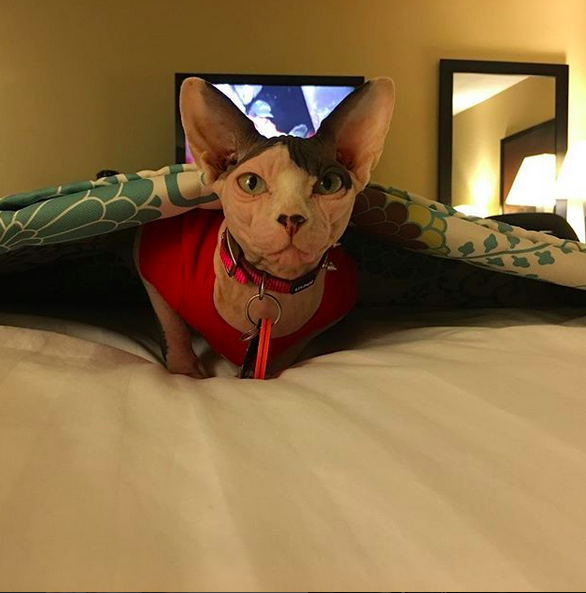 Of course cat-friendly hotels aren’t always available, so it’s possible the Zuulie may or may not have been snuck into a hotel (ssssshhhhh!). Karlie is a Kamper Kat! 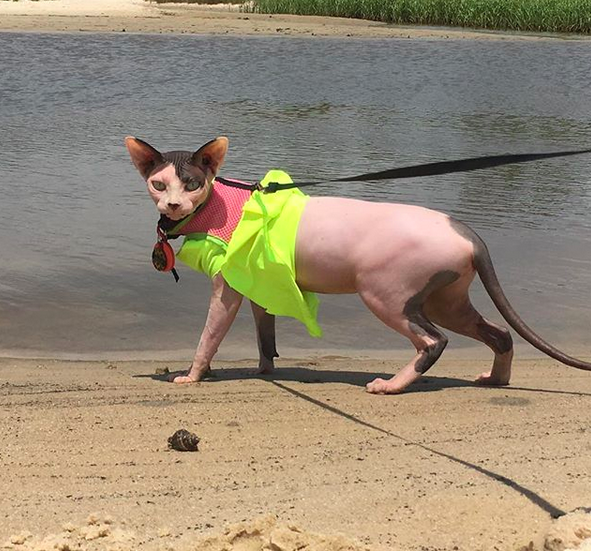 As one of the new breed of adventure cats, Karlie can be found most weekends at a state park. Not exactly roughing it, Karlie’s resides in a seventeen foot Cassita camper. The camper is in fact air conditioned, providing relief to Missouri’s hot summer weather. The camper is her territory, and is Karlie’s home away from home. In the camper, the litter box is kept in the bathroom, which behind the door with the mirror. 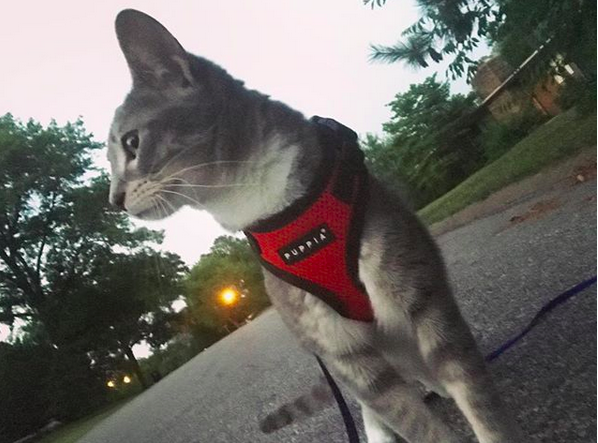 A harness is a must for travel cats. 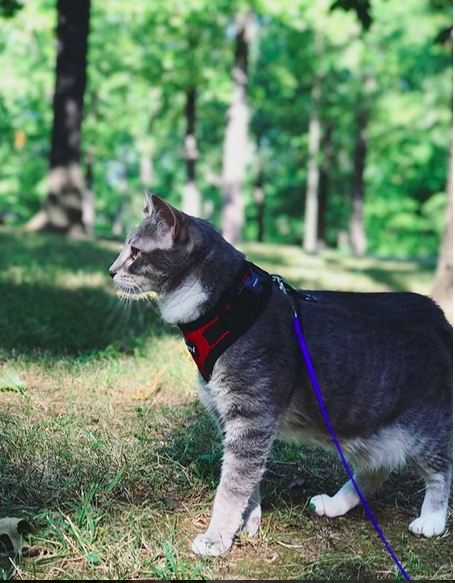 While finding the best harness for your cat is something of a matter of preference, our travel cats offered some great advice on getting started with a harness. Margo highly recommends a figure eight harness, especially for training. The figure eight harness is easy to slide on, yet pretty much impossible for the cat to escape. This is an excellent harness to start with, especially if you are concerned about the cat slipping the harness. 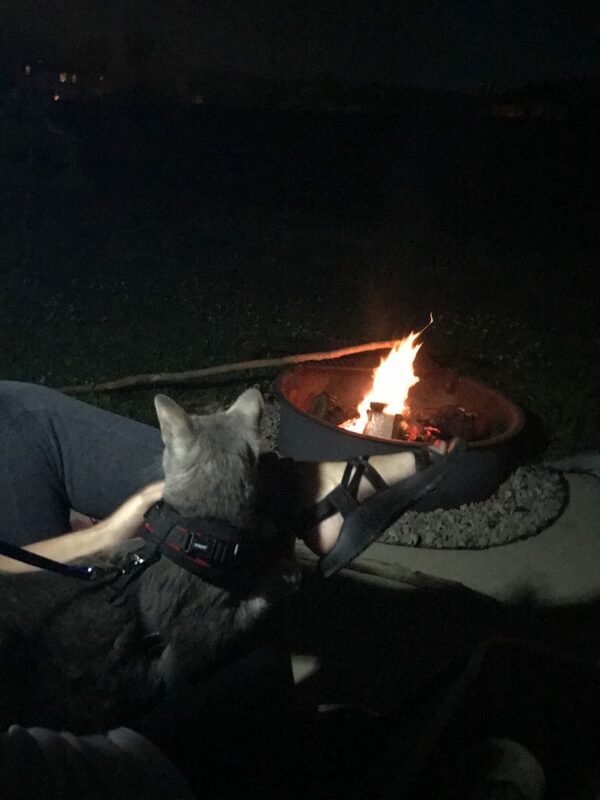 In training your cat to accept a harness, Kristen recommends having the cat wear the harness around the house for increasing longer periods of time to get accustomed to it. She also advises that she puts a leash on the harness before the door is opened, to get the cat accustomed to the protocol and discourage escapes. Finding the right harness can be largely a matter of personal preference. Ever fashionable Zuulie has a wardrobe of harnesses, but Karlie favors the Puppia brand that she purchased off Amazon. The top-rated, all-cotton Kitty Holster is another popular harness favored by adventure cat enthusiasts. Fans praise the look, the ease of entry, and also the near impossibility of the cat escaping the harness. With the new gear available, taking the cat can quite literally mean packing the cat up on your back in a backpack. Zuulie is a big fan of her capsule bubble backpack. The pack allows the “bubble” to be left on or removed, for Zuulie to pop her head out. It’s also big enough to have a bed in the bottom, for an extra comfortable ride. 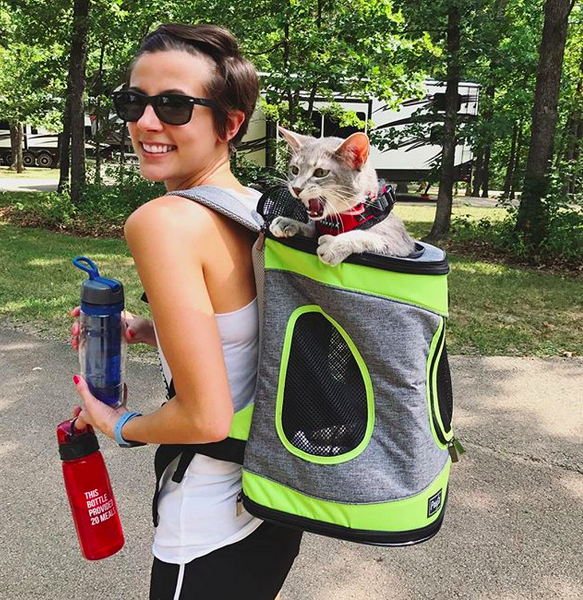 Karlie is loving their new Petsfit cat backpack this summer. In selecting a pack, Kristen opted for a larger pack to give Karlie a little more room. Looks like it is working out pretty well! Both packs are available through Amazon. The point of all this travel is simply the time spent with those we love! 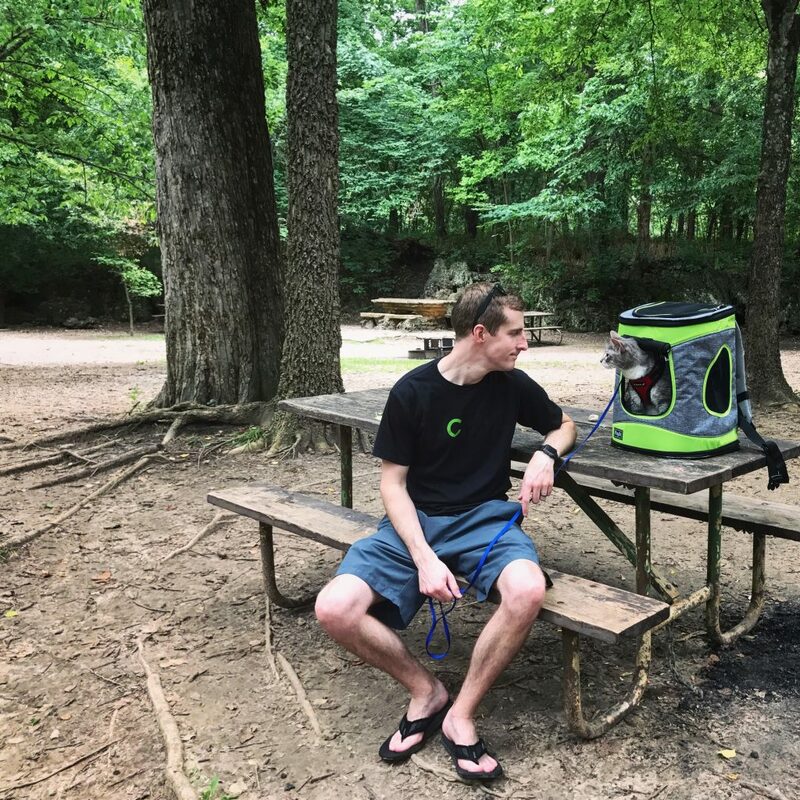 Whether its hanging by the campfire or hanging with the big dogs, it’s all about the twin joys of companionship and adventure. Enjoy the journey. If you’re lucky, you have a cat riding shotgun. 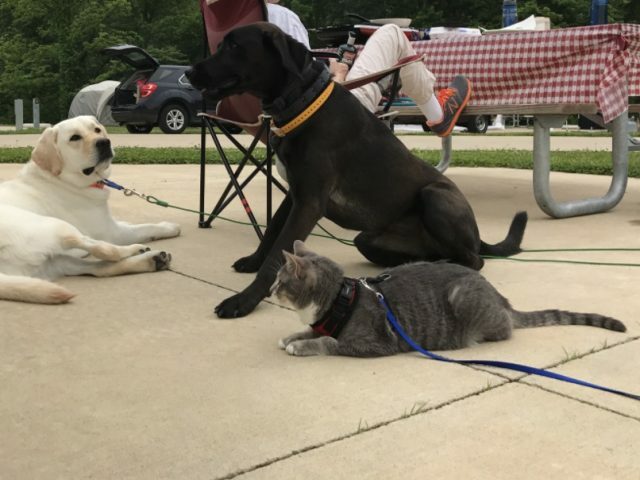 Karlie meeting new friends at the campground.